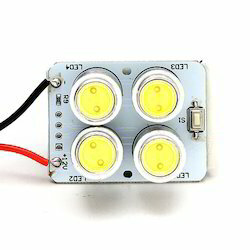 Our organization is ranked amongst the reputed names in the market for providing LED Spare Parts. Furthermore, we present this range to our patrons at nominal prices. Application: LED Products ( LED Strip light,etc). We offer highly reliable LED Drivers for LED Down Lighters. We are offering CFL Bulb Raw Material. We Sun Light bring forth vast industrial experience and expertise in this business, involved in offering a high-quality range of AC LED Drivers. Owing to years of experience in the industry we offer an extensive range of LED Driver that is durable in nature and in adherence with set quality standards. A heat - source for Tungsten Material used in resistance - heating vacuum metallizing used for surface coating. For Automotive Lamp Reflectors, Mirrors, Mobile Phone Cases, Cosmetic Product Containers, Jewelry etc.